Arsenal need to find the right balance between attack and defence if they are to finish the season successfully, manager Arsene Wenger says. Wenger saw Pierre-Emerick Aubameyang score a debut goal and Aaron Ramsey his first hat-trick as his side thumped a disorganised Everton. 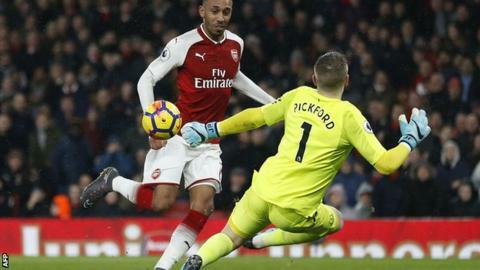 However, Arsenal have not kept a clean sheet in eight Premier League matches, and finished Saturday's match five points adrift of a Champions League qualification place. "Our challenge is to find a balance," Wenger said. "We're a very offensive team but need to find a balance between attacking and defending. That will be our challenge until the end of the season." Aubameyang, a club-record £56m signing from Borussia Dortmund on Wednesday, chipped in from fellow new arrival Henrikh Mkhitaryan's pass as the home side led 4-0 by half-time. Television replays showed the goal should have been ruled out for offside, although the visitors could hardly claim the decision made a huge difference to the match. Everton conceded three times in the opening 20 minutes amid defensive chaos, with Ramsey touching in the opener from Mkhitaryan's cross. Laurent Koscielny got in front of Aubameyang to head the second at the far post after Shkodran Mustafi glanced on Mesut Ozil's corner, before Ramsey scored a deflected third. Aubameyang struck the fourth before half-time, prompting Everton manager Sam Allardyce to abandon his three-man central defence and revert to a back four. Substitute Dominic Calvert-Lewin headed an Everton consolation from Cuco Martina's left-wing delivery, before Ramsey swept in his hat-trick goal from another low Mkhitaryan cross. Wenger was pleased with Ramsey's showing, saying: "He is calm in finishing. He used to rush it. Over the years, I think he can get 10-15 goals a season." However, Arsenal lost goalkeeper Petr Cech to a calf injury in a collision with Oumar Niasse as the striker hit the post in the second half. Football Daily podcast: Is Sterling's miss up there with Rosenthal's? In normal circumstances, Ramsey's hat-trick would have guaranteed him the headlines, but Aubameyang's high-profile arrival during the week ensured he grabbed the attention. The Gabon striker did much to lift the mood among fans despondent after Tuesday's 3-1 defeat at Swansea. Aubameyang overcame a midweek illness to start against Everton - and his first display in Arsenal red was perhaps a sign of things to come. There was a well taken goal, although it should not have counted, and a demonstration of his fearsome pace. In one first-half break he raced clear on to an Ozil pass and he was denied only by the knees of Everton goalkeeper Jordan Pickford. On the flip side, there was also a hint of his individualistic streak - he did not seem too thrilled when Koscielny beat him to the scoring touch for Arsenal's second, throwing his arms out in front of him in an apparent gesture of mild frustration. He can drift out of games too. He touched the ball 25 times during the match. No outfield player who started the game had fewer touches. However, if he can produce the kind of scoring form that marked his time at Dortmund - where he worked well with Mkhitaryan - Arsenal may yet reach the top four. "It is very early, but they look to have the quality to integrate into the game we want to play," Wenger said. "They are quick, have sharp movement and are agile and want the ball. It is very good and positive signs." Sam Allardyce's 500th game as a Premier League manager was ruined as a decision to start with a three-man central defence backfired spectacularly. His Everton side lacked defensive discipline as they made only three tackles in the first half, while players were frequently caught out of position. Allardyce's plan appeared to be to shut out the home side centrally while using Jonjoe Kenny and Cuco Martina as attacking wing-backs. It would have been a big enough test for a defensive line-up used to playing together. In a line-up containing one debutant - Eliaquim Mangala - and two other defensive changes from the previous game, it was a recipe for calamity. There were far too many gaps between the central defenders, while neither Kenny nor Martina seemed to have any idea as to how close they were supposed to stay to the back three. Mangala, signed on loan from Manchester City on Wednesday, had a dreadful debut: he was dragged all over the place as Mkhitaryan crossed for Ramsey's first, and it was his deflection that took Ramsey's shot beyond Pickford for the third goal. Arsenal could have had more than four before half-time, as Nacho Monreal headed against the post from a Granit Xhaka corner. Everton were better once they switched to a 4-4-1-1 formation for the second half, with Tom Davies on for Michael Keane, but never had a hope of recovery. It was a miserable return to Emirates Stadium for Everton winger Theo Walcott, signed from Arsenal in January. He had one first-half chance from a Niasse flick through, but Mustafi - a former academy player at Goodison Park - made a goal-saving challenge. Former England captain Alan Shearer on Match of the Day: "Arsenal were brilliant and they could have scored six or seven goals. "From an Everton point of view, if ever there was an example of football coming back to bite you, it was this - after Sam Allardyce suggested in his press conference before the game that Arsenal's defence was weak. "Everton were all over the place. They were embarrassing. They were hopeless defensively in the first 45 minutes." Former England midfielder Danny Murphy on Match of the Day: "Arsenal's new boys did really well. Mkhitaryan was the star of the show. I don't think he got the chances he should have done at Manchester United. "Aubameyang showed great pace and calmness considering it's a big deal when you make your debut. It was a really clever finish for his goal. "When Arsenal play like this, they can beat anybody. They just don't play like this away from home." Aaron Ramsey has been directly involved in 101 goals for Arsenal in all competition (53 goals, 48 assists). Arsenal have a Wembley derby against Tottenham in the Premier League next Saturday (12:30 GMT). On the same day, Everton host Crystal Palace (15:00). Match ends, Arsenal 5, Everton 1. Second Half ends, Arsenal 5, Everton 1. Attempt saved. Idrissa Gueye (Everton) right footed shot from outside the box is saved in the centre of the goal. Corner, Everton. Conceded by Shkodran Mustafi. Offside, Arsenal. Héctor Bellerín tries a through ball, but Pierre-Emerick Aubameyang is caught offside. Corner, Everton. Conceded by Sead Kolasinac. Attempt missed. Dominic Calvert-Lewin (Everton) right footed shot from the centre of the box misses to the right. Assisted by Tom Davies. Attempt missed. Cenk Tosun (Everton) right footed shot from outside the box misses to the left. Assisted by Tom Davies. Substitution, Everton. Cenk Tosun replaces Oumar Niasse. Substitution, Arsenal. Jack Wilshere replaces Aaron Ramsey. Goal! Arsenal 5, Everton 1. Aaron Ramsey (Arsenal) right footed shot from the centre of the box to the bottom right corner. Assisted by Henrikh Mkhitaryan. Corner, Everton. Conceded by Laurent Koscielny. Substitution, Arsenal. David Ospina replaces Petr Cech because of an injury. Delay in match Petr Cech (Arsenal) because of an injury. Offside, Everton. Jonjoe Kenny tries a through ball, but Oumar Niasse is caught offside. Attempt blocked. Eliaquim Mangala (Everton) right footed shot from the centre of the box is blocked. Assisted by Dominic Calvert-Lewin. Goal! Arsenal 4, Everton 1. Dominic Calvert-Lewin (Everton) header from the centre of the box to the centre of the goal. Assisted by Cuco Martina with a cross. Attempt saved. Henrikh Mkhitaryan (Arsenal) left footed shot from the centre of the box is saved in the bottom left corner. Assisted by Mesut Özil. Oumar Niasse (Everton) hits the left post with a left footed shot from the left side of the six yard box. Assisted by Theo Walcott with a cross. Attempt blocked. Theo Walcott (Everton) right footed shot from the left side of the box is blocked. Corner, Everton. Conceded by Granit Xhaka. Substitution, Arsenal. Sead Kolasinac replaces Nacho Monreal. Second Half begins Arsenal 4, Everton 0. Substitution, Everton. Tom Davies replaces Michael Keane.